These photos were taken few years ago when we went to San Francisco after the Thanksgiving day. Akesha was less than a year old I guess. We took a double Decker bus and we saw all the beautiful sights around the famous San Francisco. While on our way to the Capitol, we saw this weird building...some people called it the "House of Falling Furniture". 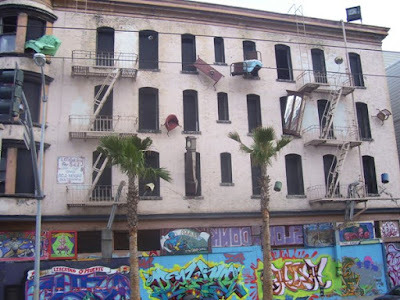 Called “DEFENESTRATION” the abandoned four-story tenement building sitting at the corner of 6th st. and howard st. in San Fransiscio, California has been a sculptural mural since 1997. This multi-disciplinary sculptural mural involves seemingly animated furniture : tables, chairs, lamps, grandfather clocks, a refrigerator, and couches, their bodies bent like centipedes, fastened to the walls and window-sills, their insect-like legs seeming to grasp the surfaces. Against society’s expectations, these everyday objects flood out of windows like escapees, out onto available ledges, up and down the walls, onto the fire escapes and off the roof.”DEFENESTRATION” was created with the help of over 100 volunteers. 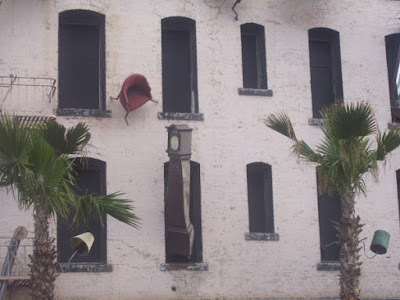 The concept of “DEFENESTRATION”, a word literally meaning “to throw out of a window,” is embodied by the both the site and staging of this installation. If you are looking for a Collision Repair Experts in Anaheim, you should not look further because auto body anaheim is ready to help. You can make an appointment online today. So what are you waiting for?